and provides just enough grip to break down dirt, oil and makeup. 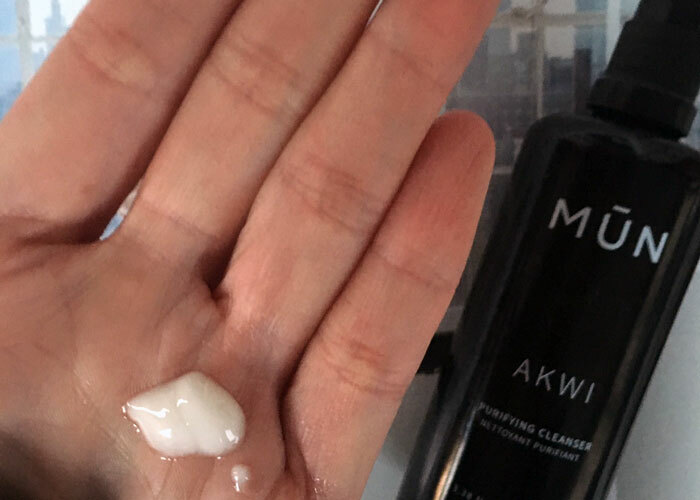 Basically, MUN Akwi Purifying Cleanser is your first step cleansing gel-oil-cream dream come true. I’ve been using this beauty since Thanksgiving 2016 and have consistently chosen it over various balms and oils in my collection. MUN recommends 6-8 pumps (the picture above shows 2 pumps) on a dry face; I usually use 8-10 to get my entire face and neck clean. As someone who has been doing double cleansing since her teen years (it just wasn’t called that back then, and I used baby oil back then), it’s been difficult to break from my preference for plant oils when beginning my first cleanse. Typically, I choose something simple (jojoba, grapeseed, argan or whatever I have on hand) and massage that into my skin for several minutes to break down my makeup and get the blood flowing. There’s never been any true problem with this method, but depending on the packaging of your oil, you can get too much, spill some … basically, make a mess. Or an E3 tornado on the bathroom vanity. Or a “Kimnado” if you’re using my loving boyfriend’s words. You get the picture. With cleansing balms, usually packaged in jars, you can control these Kimnados more because you aren’t dealing with slippery oil. But, it’s a jar. That you’re sticking your (clean) fingers into. Or, if you’re perfect, sticking tiny (clean) spoons into. I’m not perfect, and I know that about halfway through a jar, it just gets kind of gross. So while I have several favorite cleansing balms, they haven’t gotten much action since MUN Akwi Purifying Cleanser came along. As mentioned, MUN Akwi Purifying Cleanser is the first step in a double cleansing routine. Apply 6-10 pumps, depending on your preference, to your dry, made-up face, massaging it from the inside out (I usually start at my nose, which is always congested). You’ll notice that the texture is very grippy; that’s thanks to a blend of castor, argan, camellia, rice bran and cucumber oils. You won’t find this cleanser running or dripping down your face — thanks, density! You’ll also notice a very faint scent of orange, thanks to yuzu essential oil, that dissipates very quickly as you enjoy your routine. For a very thorough first cleanse, do this for at least five minutes. More if you have time and want to wind down a bit. If you’re indulgent like I am, you may add an additional pump to ensure you get enough product to break down mascara, eye makeup and brow powder — and it will, trust me. Once you’re ready to rock and roll, I always recommend using a very warm washcloth to remove any type of first cleanse. I wet and rewet my cloth 3-4 times and gently roll it around my face (do NOT scrub!) to get rid of all excess product and enjoy some gentle exfoliation. MUN says you can also wash this cleanser off with simply hands and water, as it will emulsify and rinse off. That has NOT been my experience with this cleanser — and that’s NOT how I prefer to use ANY sort of first cleanse, anyway. When you have acneic skin, just … no. I always, always, always use a wash cloth to remove my first cleanse, as I take zero chances with having any dense oils left on my skin to clog my pores even after a second cleanse. 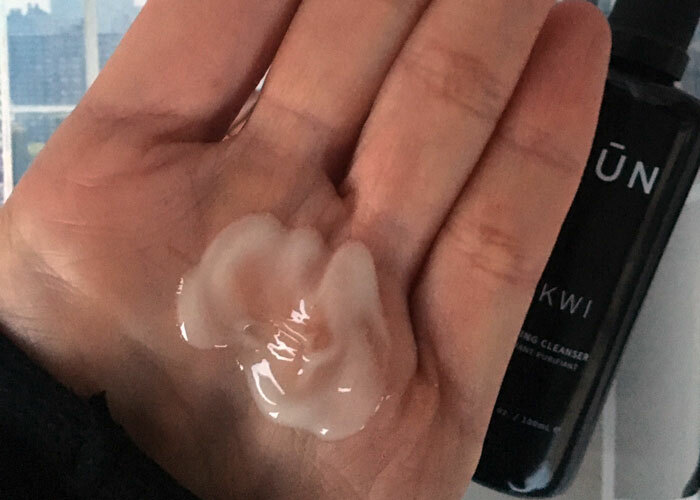 Overall, MUN Akwi Purifying Cleanser provides an A+ first cleansing experience thanks to its hygienic packaging, thoughtful formula and generally neutral scent. At $60 for 3.38 ounces, it’s undoubtedly expensive compared to simple, straight carrier oils, but is on par with another absolute favorite first cleanse balm. I’d repurchase and recommend this to anyone looking for a chic, clean, hygienic first cleanser from a celebrated green beauty brand. What do you look for in a first cleanser? Do you prefer oils, balms or some sort of hybrid? Have you tried anything from MUN? Tell me in the comments!